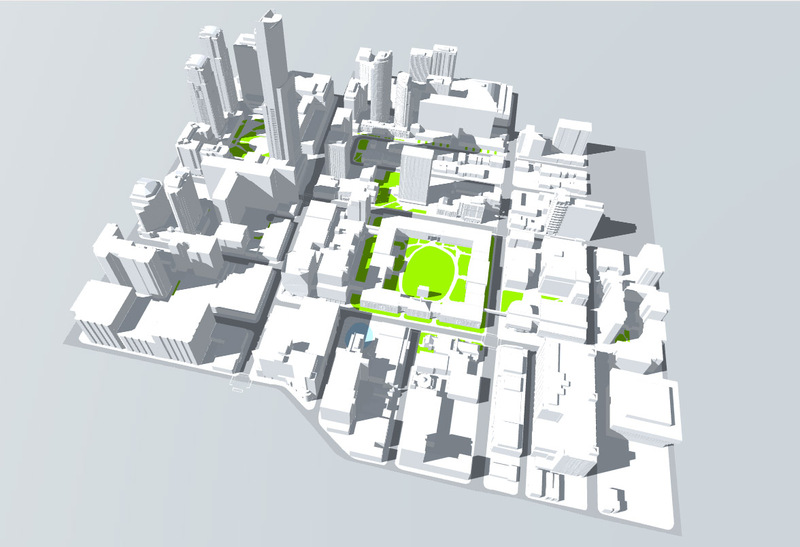 One of the most useful visualization and planning tools used in urban planning and design is the 3D model: a to-scale representation of the built form of a city, its existing (and as-built) conditions and its proposed (or possible) conditions. A 3D model effectively communicates information about the proportion, size, and distribution of structures and other urban elements, that when well made and presented is intuitively grasped by the people that are viewing it. A principal drawback to most 3D models is that they are physical models, and they take a lot of time to create, to modify, and can only be shared with an audience who is physically present. One way to solve the this problem is to replace the physical with a 3D digital model (using 3D modelling software such as Rhino, ArchiCAD, Blender, Solidworks, etc.) and to share the models with other users. Yet, there are drawbacks to this approach, too. For one, these models can only be shared with users that have the same (or similar) software of the kind that was used to create the model. For users who do not have the correct software, static or animated representations of the model are made which, while they can still convey information, do not allow the user make choices on what aspects of the model they want to view or explore. Beyond this technical problem, the models are not geographic and they are not data-driven. Though they are spatial, they are not referenced to a location on the earth and they don’t contain attributes. There is no way to know what building or open space you are looking at without asking someone who is familiar with the model. Informal exploration is just too limited. One way to solve these problems is to store and view 3D model information in CloudCities. 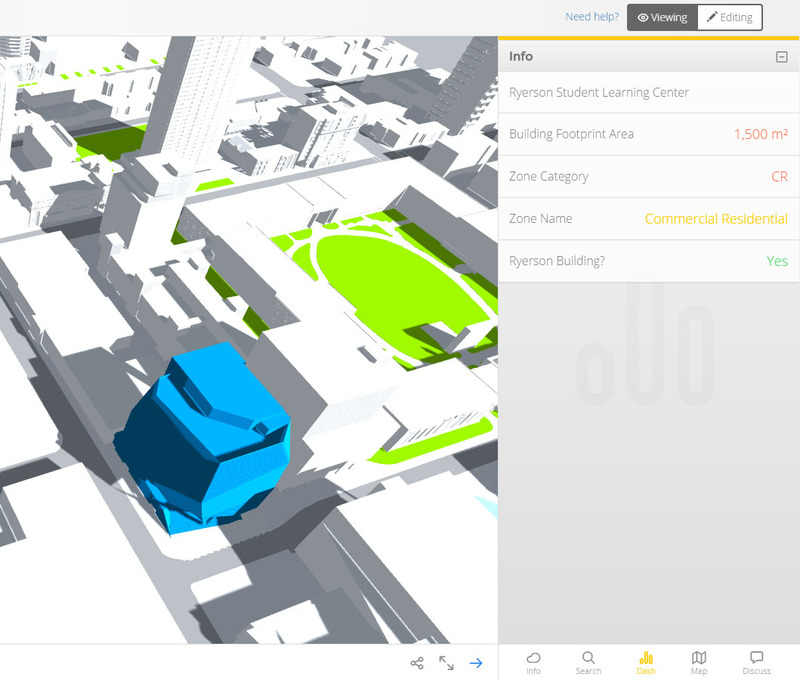 CloudCities allows users to upload 3D model information, such as a building, tree, vehicle, or terrain, as well as their attributes. Not all 3D information can be uploaded (for instance, stylized 3D lines or other non-geographic 3D visualizations are not generally possible). 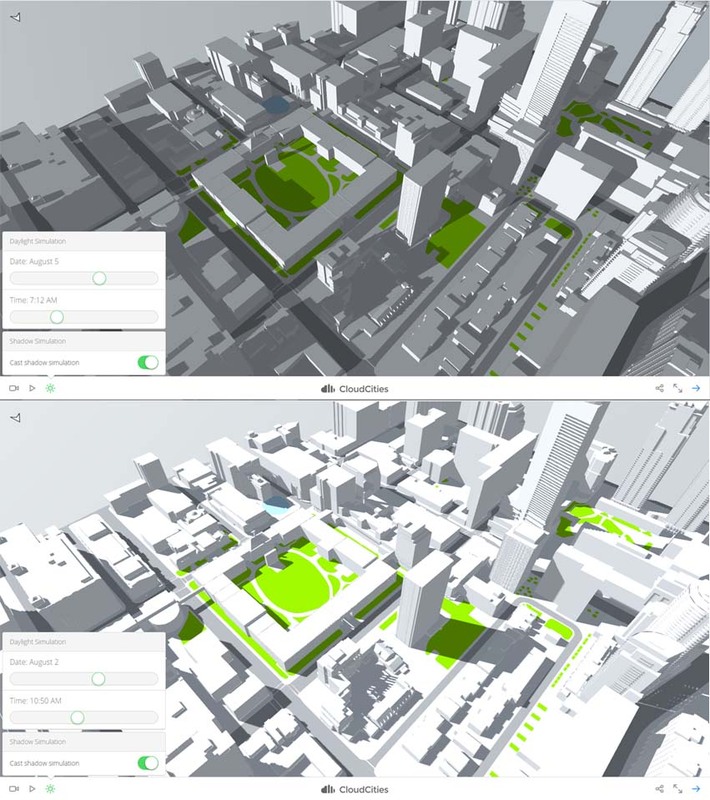 In addition to upload, CloudCities has several customization features that allow the model scene to be modified: sun/shadow settings; pre-set camera views and 3D slides; a search function; location comparison to OpenStreetMap; and dynamic attribute and 3D editing, which allows the user to dynamically modify/add to object attributes and to use basic 3D editing functions. 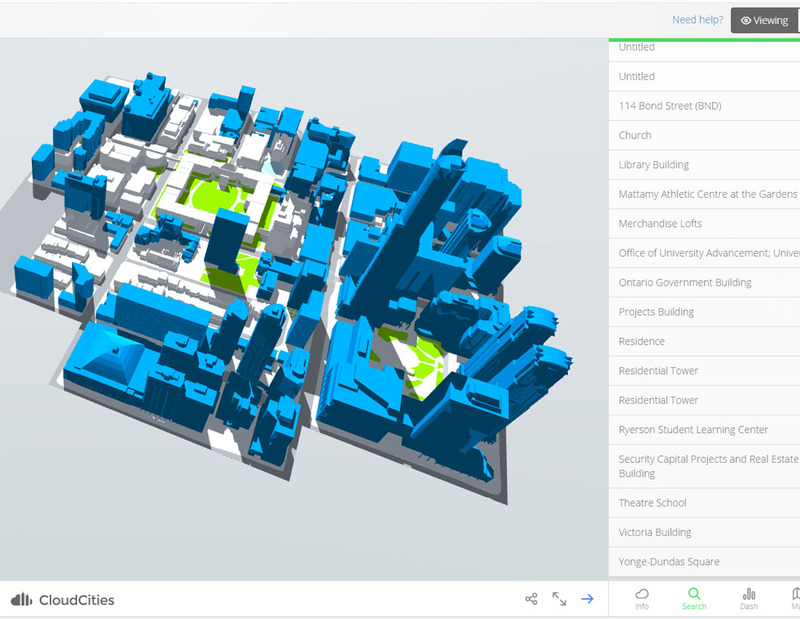 CloudCities is built to store and view 3D models (as opposed to general 3D visualizations), and specifically 3D models of cities (multiple buildings, blocks, terrain, etc.) so for this project I have built a model of the bulk of Ryerson University’s Campus in downtown Toronto. The input data for the model’s 3D buildings is from two sources: myself, who modelled several buildings on the Ryerson campus, including Kerr Hall, in Rhinoceros (Rhino), a 3D modelling program, and the City of Toronto’s Open Data portal, which maintains a 3D massing and building model dataset that is frequently updated and that is available in several formats. 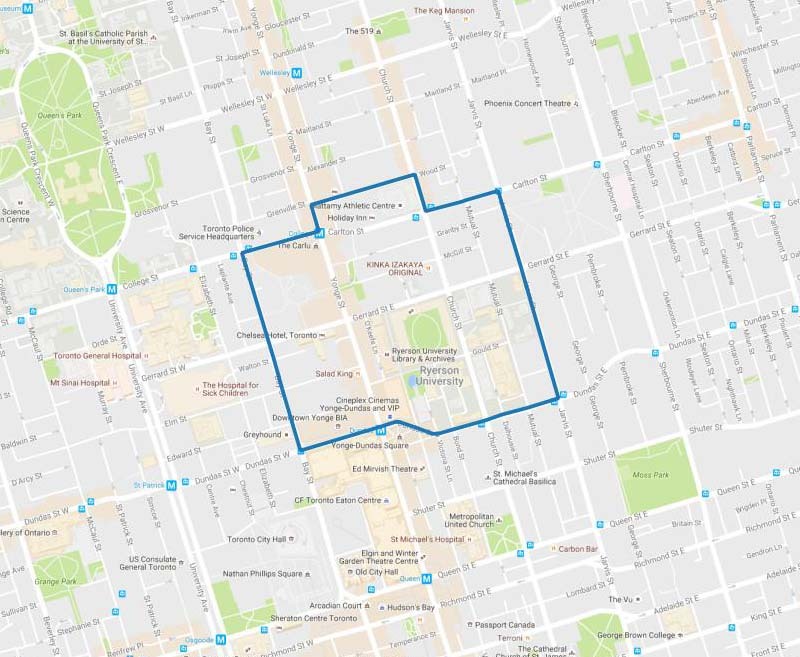 The 3D information from the City of Toronto is of high quality, but it is released in several formats, and not all of these formats contain equivalent data. Out of all of the data available, the 3D CAD information is the most detailed and accurate but it is harder to work with. Ultimately, all of the 3D information that fits within the sample area were converted, by individual building, into multipatch features using the ArcGIS 3D Analyst extension. These multipatches were loaded into ArcScene, exported to an ESRI 3D webscene format, and then uploaded into a CloudCities scene. While there are other ways to create a functional CloudCities scene, uploading from ArcScene is the most straightforward, though it is certainly not an option for everyone (see the Asset import tutorial), especially when they do not have ArcScene or 3D Analyst available to use! I manually modelled Kerr Hall because I wanted it to be more detailed than that stored within the City of Toronto dataset. The modelling was done in Rhino. The model was then exported from Rhino into .3DS format, then to multipatch to be included into the webscene uploaded into CloudCities. 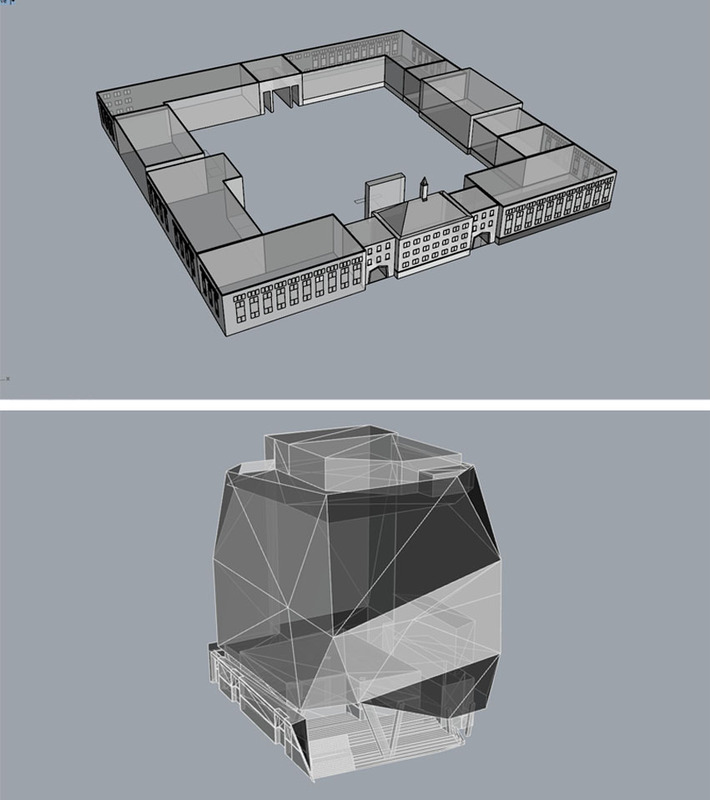 Deletion of original building massing data from the City of Toronto dataset was required where another model instance – in this case, custom-models like that of Kerr Hall – takes its place. Zoning information is also provided by the City’s Open Data portal and this was used to code each building instance with its associated zone category (e.g. R or ‘Residential’). I have customized and manually refined City blocks (which define the road surfaces) and green open space areas because these are not accurately captured within the City’s data. Terrain surfaces and trees (which can be very complex objects) were not added to this model because of the eventual data size requirements, but in order for these elements to look good and not awkward, they must be of sufficient detail. Terrain published by the City of Toronto, even when simplified, is a complex geometry that would weigh on the model’s performance. In addition, terrain requires that buildings sit on top of the surface, but the buildings modelled by the City do not account for an uneven grade around the base (what is known as Finished Floor Elevation). While this detail can be made within the models, the eventual time required would have been onerous. The more detail in a building and the more the model approximates reality, the longer the model will take to create. 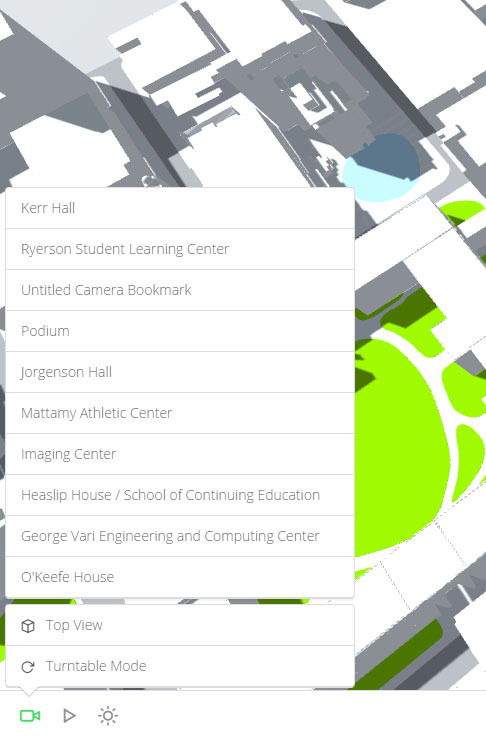 In the CloudCities model, buildings contain a name, whether they are Ryerson University buildings, the planning zone they fall within (e.g. commercial or residential), and the size of the building footprint area in sq.m. Some of this information is added within the pre-upload ArcGIS environment, but much of it is added from within CloudCities’ editing environment. These attributes serve as the basis for dashboards and a search bar. The dashboard displays these vital statistics whenever a building object is clicked. Dashboard reveals attributes when a building is clicked. Additionally, a search bar and search constraints can be set, and the user can search through the scene’s attributes to highlight objects that are returned. For instance, every building that has the zone ‘Commercial Residential’ is highlighted whenever that term is entered into the search. The search functions are limited, however – there are no advanced queries supported by CloudCities. Instead, various constraints on searches must be set on the back end to make sure that a particular search does not return any object that fulfills any small dimension of the attribute data. Specific locations can be saved as bookmarks, and these aid in presentation purposes. These locations can be combined into a slideshow “tour” of the model. This is a particularly relevant feature when sending the model to others, as the locations are stored with the scene, and literally move the user point of view around the model in order to tell a story. A sun/shade rendering tool can be implemented, which allows the user to set the time of year and time of day to create a realistic view of how shadows would be cast by model elements based on the model’s location on the earth, although this is not a sun shadow calculator and is meant simply to enhance the experience of the model. One of the main limitations of CloudCities is that it is not customizable from a development point of view. A user is limited to pre-set dashboard, search, and styling options. In addition, the platform costs money and is billed at a hefty $60 USD+/per month in order to create a city model to the detail that was made for this post. The range of 3D visualizations possible is limited. It would be nice to have a platform that incorporates more options for presenting thematic data that goes beyond dashboards and search bars. There is a lot of 3D data that does not manifest itself in a 3D structure. ThreeJS’s gallery of 3D visualizations provides interesting examples of how 3D city modelling could be developed in the future. Despite these limitations, CloudCities provides an easy-to-use platform for making and viewing 3D city models. I do not believe that CloudCities will always be the only platform that offers the same functionality, but it is currently a really good example of how urban planners and designers can take advantage of geo-technology to create a more interactive and data-rich experience of their 3D information. The final model can be viewed on CloudCities here. After mid-December 2016, the model’s geographic extents will be greatly reduced so that the model can be stored on a free account.